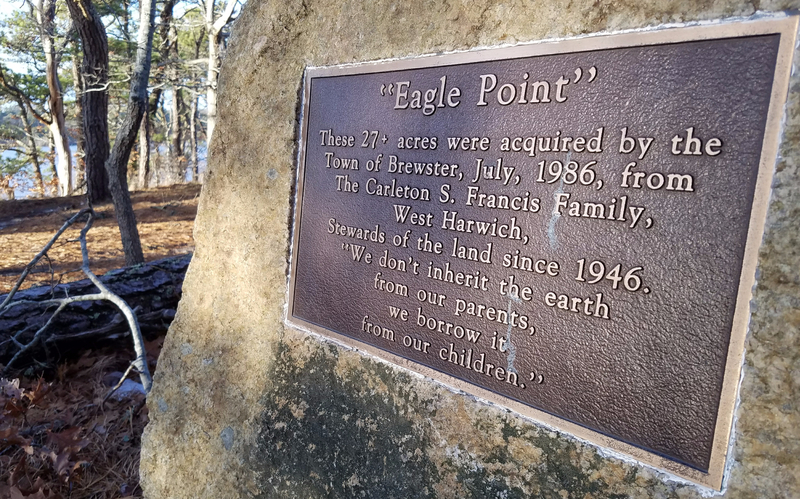 The Punkhorn Parklands in Brewster have many interesting walks but Eagle point has some of the best views. The “Punks” is 875 acres of town-owned land broken up by dirt roads, ponds, old bogs, a herring run, and privet property all connected by a labyrinth of single track that is welcome to all kinds of mixed usages including mountain bikers, dog walkers, and horseback riding. Eagle Point is a 27-acre chunk of land in the Punks that juts out into Uppermill Pond. It has two main trails that loop around it bringing you to an old bog, and abandoned Ford Model T, and a killer view to the west where you can watch the sunset over the water. The trail running along the edge of the pond can be muddy but the scenery is great and the pond itself is sandy bottomed and clear. The official parking lot is off of Westgate Rd just north of the water department building, but during the offseason, there is usually enough parking at the boat ramp. The trails are well-marked and make for a 1-mile loop with benches at the overlooks. It’s easy to get lost in the punks but there are some maps over at www.secludedcapecod.com to help you find your way. Parking can be found on the Adventure Map and the complete Cape Cod Pathways trail is over there also. Enjoy you Cape Cod adventures this summer.